Let us bring the museum to you! Our Edukits will enhance your in-classroom learning experience and bring the past to life! The photographs from the Museum’s Collection, the artifacts as well as the replicas will help you create a memorable hands-on and engaging experience for your students. These kits are available for a 2 week loan period, free of charge. We do encourage you to make a donation of your choice to help support your local history and the Glengarry Pioneer Museum. For more information or to reserve a kit, please contact us by email [email protected] or call (613)-527-5230. What is Kwanzaa or Bannock Night? Why do people set up a Christmas tree or eat turkey for Thanksgiving? Learn all about different traditions & celebrations from all around the world and discover the history behind many of them! You will also learn about the different traditions the pioneers held and what they celebrated. Finally, find out about the many unique pioneer celebrations specific to Glengarry. The Teacher’s Booklet will provide you with the necessary background information and you will find many activities, recipes and crafts in the Activity Guide. This kit also includes books, photographs, replicas and artifacts for a hands-on experience. Immerse yourself in the life of a pioneer child and explore a typical day in their shoes! Learn more about the clothing they wore, the chores they did and the games they played. Compare your daily routine to theirs and find out what tools made their lives easier. The Teacher’s Booklet will provide you with enough background information to accompagny the many activities in the Activity Guide. 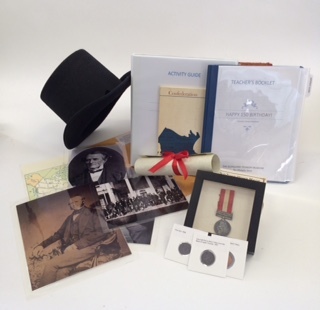 This kit also features books, photographs, artifacts and replicas who are bound to liven up any lesson! Canada will be celebrating its 150th birthday on July 1st 2017. This kit includes all things Confederation. It discusses the various events that led up to Confederation, who the Father’s of Confederation were and how Glengarry may or may not have been involved in the creation of Canada. The Teacher’s Booklet will provide you with background information to supplement the various activities you will find in the Activity Guide, such as analyzing the “Power of Political Cartoons”. This kit also includes photographs, replicas and artifacts from the Confederation Era to make Confederation really come alive for your students!